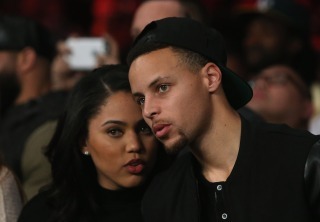 No doubt, Steph Curry is a superstar and possibly even the best shooter in NBA history, but it seems the Golden State Warrior may have some competition in his own household: His wife, Ayesha. The couple is currently enjoying a trip through Asia as a part of the Under Armour promotional tour. During a stop in Guangzhou, China, the power couple joined a quick outdoor game of hoops. In a video posted on her Instagram on Sunday, Ayesha Curry is seen nailing a three-point shot from the right side of the court. She then breaks out into a victory dance as her husband watches in complete bliss.